The 27 books of the New Testament, as known, constitute the fundamental holy scripture of Christianity. Without the four Gospels according to Matthew, to Mark, to Luke and to John, Christianity is virtually null and void. Recent epoch-making discoveries of old Sanskrit manuscripts in Central Asia and Kashmir provide decisive proof that the four Greek Gospels have been translated directly from the Sanskrit. A careful comparison, word by word, sentence by sentence, shows that the Christian Gospels are Pirate-copies of the Buddhist Gospels (combined, of course, with words from the OT). God's word, therefore, is originally Buddha's word. Comparison reveals that there is no person, no event, no locality mentioned in the four Christian Gospels not already present in the Buddhist Gospels that are, for sure, far earlier in time than their Christian copies. You become a Buddhist by receieving initiation (uapasampadâ), and by confessing your faith in the Trinity of the Buddha, his teaching and his order. In the Christian version you become baptized (baptisma), and confess your faith in the Trinity Father (Buddha), his son (bodhisattvaa) and the Church of holy men. The Apostles´s Creed (Symbolum Apostolicum) can be traced back to Buddhists sources. Christian tradition traces it back to Peter, Andreas and the remaining ten apostles. They are all Buddhists: Putras, Aniruddhas, etc. It was the task of the Buddhist apostles to promote the Dharmacakram all over the world. Mainly responsible for doing so were Peter and Paul. These two are to be traced back to the Lotus Gospel, chapters 3 and 8. Putras becomes Petros, and Pûrnas becomes Paulos or Saulos (= 901 = ho Pûrnas). Names are slightly changed for the source has to be kept secret. Hence the secret of Christ and the "mystery" of the Kingdom of God, i.e. Buddhism. Even the titles of the main Buddhist gospels can be found in the Greek text of the NT, provided you know how to look and listen and count words and syllables. The main figure in the NT is the new Tathâgatas, the kathêgêtês, or teacher of Matthew 23,10. There are about 20 puns on Tathâgata(s, sya) in the NT. Indeed, the New Diathêkê is a sûtram about a new Tathâgata. 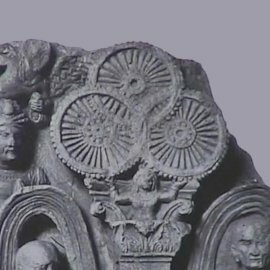 The Sanskrit sûtram is a synonym of the Greek euaggelion. It is thus the duty of serious scholars to trace the Buddhist sources that, combined with Old Testament sources, form the celebrated but little understood mosaic: The New Tathâgata. From the very start, Buddhist missionaries, mostly unknown, assimilated their promotion of the Dharmacakram to local circumstances, working in several languages simultaneously. It is the same picture in all the countries where Buddhism expanded, typically - and most successfully - by way of "skilful means", or pious deceptions (frays pia). The concept of skilful means is typical of Mahâyâna, as is prayer and confession of sins. It is in this sense that I claim that Christianity is Buddhism (Mahâyâna) for the West.